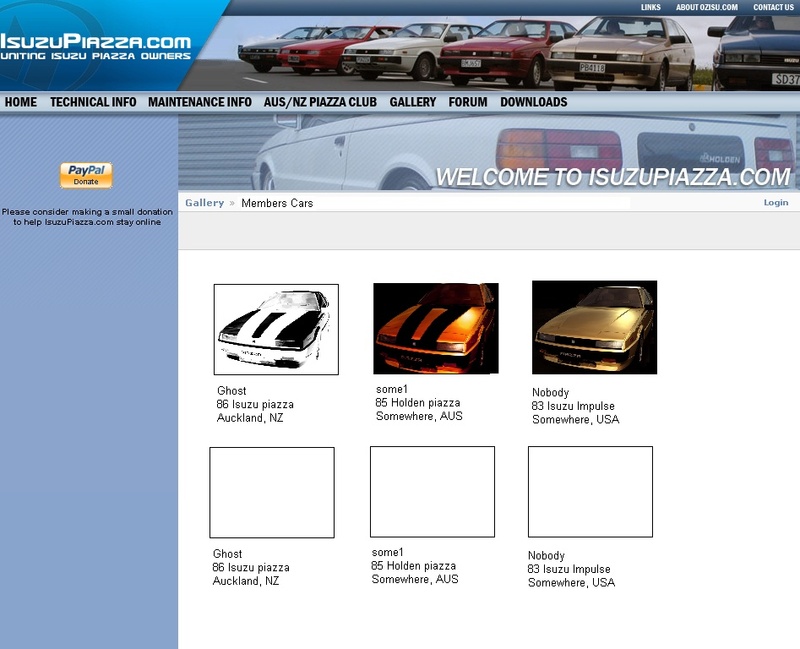 I think we need a better showroom fro pic's of piazza's. The one on the fourm no longer shows pic's as they were linked to ozisu.com. Most of the previous links should still be active, unless they are linked to the "puplic" folder, that folder suffered some major hard drive corruption at the previous host some years ago and I was only able to get back about 10% of the original files. Anything posted in the last 12 months should still be active though. If you notice any that aren't active and not pointing to the "puplic" folder can you let me know and let me know the link to the post also? The site really needs a good going over but I am currently working 16 hours a day (literally) and have very little spare time left to clear things up. If there is a general problem for many photos though it might be easy to fix it fairly quickly with a few small code modifications. I think it would be good to spend a bit of time going through the showroom and adding the remaining photos in there to the actual Photo Gallery we have here now, would make sure the images are always safe for the future and can be viewed by everyone. I wish the website paid the bills then I could spend my time doing heaps of cool things to it lol, really need some assistance from the current mods / admins from now on though as I'm really short on time. set it up if u can!!!!! I just happen to have pics of all the cars that have been on the NZ cruises!! we can set them up with the stats for each car.. Gives people an idea of what we have and what we have done. Thanks so much, I knew you guys wouldnt let me down. Im so happy to see so many people with nice rides this please's me so much. Keep up the good work. How do i put my pic's on here?